The new online multiplayer mode "Hunter, Hunted" is a last-team-standing brawl between Batman, three Bane thugs, and three Joker thugs. A tense new multiplayer mode released today adds a few twists to Batman: Arkham Origins. Warner Bros. released "Hunter, Hunted", a multiplayer mode designed around "last man standing" mechanics. "Hunter, Hunted" is a 3v3v1 mode, putting three Bane thugs, three Joker thugs, and the Dark Knight himself in a battle for supremacy. The new multiplayer mode has no respawns, so players will have to use caution and cooperate with their teams (or swoop out of the darkness) to take out their enemies and claim victory. Players can access the new multiplayer mode now on PS3, Xbox 360, and PC. To celebrate the release of the new multiplayer mode, Warner Bros is holding a double credits event for Batman: Arkham Origins. Any online multiplayer matches played until 11:59 PST on Monday, December 16 will earn players double the usual Arkham Credits. Arkham Credits can be spent on Cobblepot Crates to unlock items, weapons, and clothing in multiplayer mode. The "Hunter, Hunted" mode was developed by Splash Damage, the studio behind BRINK and Quake Wars. 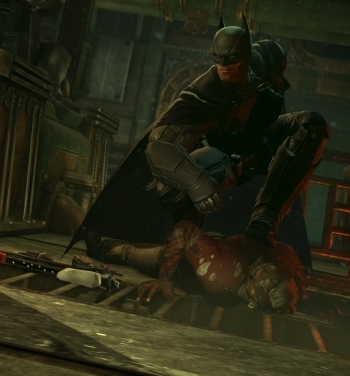 Developer WB Games Montreal previously teamed up with Splash Damage for "Invisible Predator Online", the original multiplayer mode in Batman: Arkham Origins. The original multiplayer mode is a 3v3v2 match between three Bane thugs, three Joker thugs, and the dynamic duo, Batman and Robin. Gang members can occasionally become their respective supervillains (Bane and Joker) and use their special attacks and takedowns. Batman and Robin have access to gadgets from the single player game, and the gang members have access to guns and explosives. Personally, this sounds like a really interesting twist on the multiplayer mode. Dropping out of the shadows to take out an unsuspecting thug has always been the most satisfying part of Arkham games for me, and "Hunter, Hunted" sounds like it will encourage that.